When Swamiji passed into the Infinite, it was as if an enormous wave of energy was released. As his body declined with the passing years, his consciousness expanded, until the body was simply too confining to hold it. For him it was a joyous release. And once freed, Swamiji became able, so it seems, to be with all of us everywhere even more. 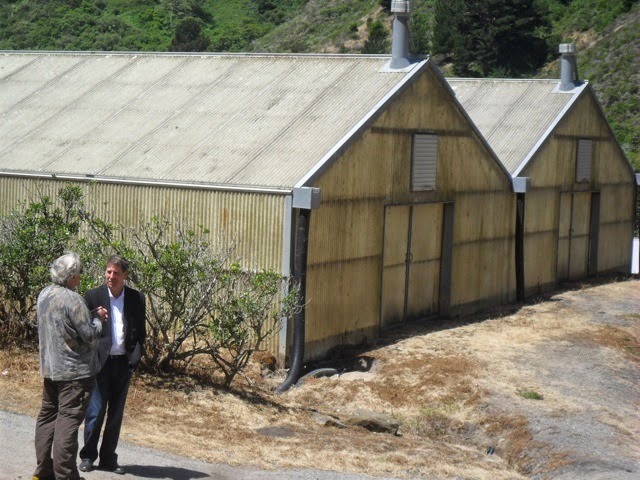 In Palo Alto, that sudden increase of energy flowing from a higher source has taken a very specific, and somewhat surprising form: the acquisition of a farm in Half Moon Bay. Those of you who are members of Ananda Sangha here have been following this story carefully over the last two months. What we are writing here is to bring our far-flung family up-to-date on the latest developments. 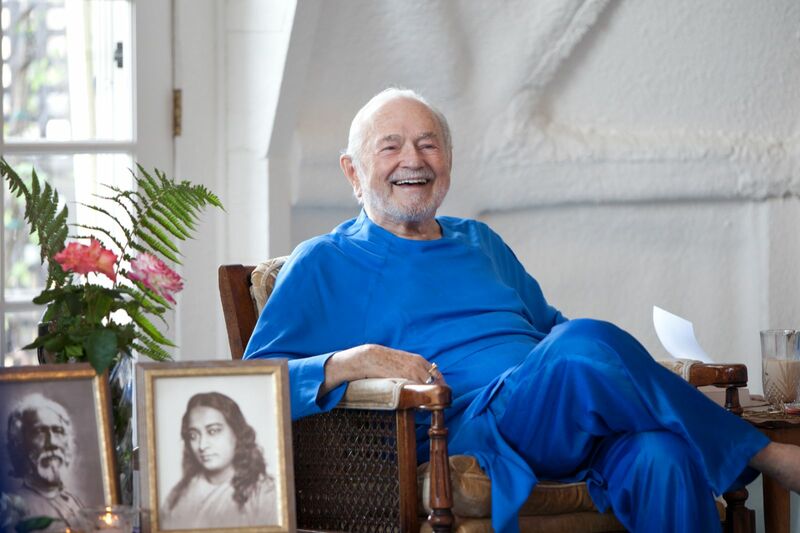 Whenever Swamiji would visit Palo Alto over the last decade, he would always urge upon us one important unfinished task: to get land farther away from the populated area, a safe haven where we could shelter and grow food if times become difficult. Master predicted such hard times would come and Swamiji often reiterated Master’s warning. None of us enjoyed hearing these predictions, but considering the source, we couldn’t ignore them either. For years we had hoped to fulfill this commission by finding an existing conference center or retreat. That way we could run it as a business and also have it as a safe haven. Retreats, it turns out, are few and far between and we never managed to find a suitable one. We decided to shift our focus from “retreat” to “working farm.” We were told that good farms, especially with sufficient water, are not that easy to find in an area where development is rampant and land is so valuable. We hoped farms were not as scarce as retreats. We passed out the word to our members that the focus of our search had shifted, and people began to send to David reports of properties they found on the internet or heard about in other ways. David reviewed on the internet some fifty possibilities, from nearby to 100 miles away. One property stood out above all the others. So much so that it came to David from a dozen different people. Buying a farm was going to be a typical Ananda experience, i.e., many hands make a miracle. Which means: no money but lots of faith! Fortunately, a long-time friend and devotee, James Morris, had recently become a Realtor. We signed up with him because we knew we could tell him the truth and he would still keep us as a client! He proved the perfect choice, not only energetic and capable, but also quite happy to start our “business meetings” with a prayer to Master. We knew that if we could find the land, God and Gurus would give us a way also to buy it. Some people believe that land has a mystic destiny and will find its owner. After our experience of acquiring this farm, we are inclined to believe it is true. It feels like home. In this case, we’ll make it short because it is a short story: In six weeks we raised $1.8 million dollars. Yes, that is the right time frame and the right amount of money. As you all know, we are not wealthy people. But we are dedicated. It was thrilling to see how much we can do when we work together for God. As it rapidly unfolded, we often joked that it was as if Swamiji, from the other side, was pushing money across to us! For years he had been telling us to buy land and he was going to make sure we followed his advice! 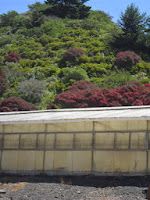 What we have bought is a working commercial farm, in the hills where Swamiji always pointed. It is two miles in from the ocean, just outside Half Moon Bay. The road ends in a secluded canyon that we are now calling Ananda Valley. Even though you are literally just 10 minutes from a good cappuccino, when you are in Ananda Valley you feel as if you are miles from any other habitation. And it is only 40 minutes from our Temple and community. 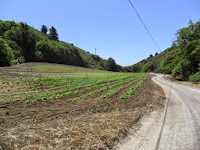 Some of the 67 acres goes up the brush-lined hills, but there are still about 25 acres of first-class farmland. There is also plenty of water—two wells, a creek, and an ever-flowing spring that comes out of granite rock, pure and drinkable. There is no primary residence on the property, just a bunkhouse and several trailers where those who work on the farm can live. 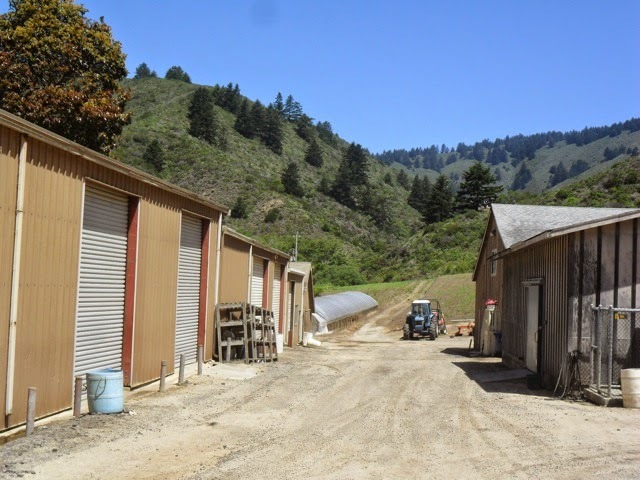 There is also a warehouse, a barn, three greenhouses, a mechanics’ shop, an irrigation pond, and all the equipment to run the farm. 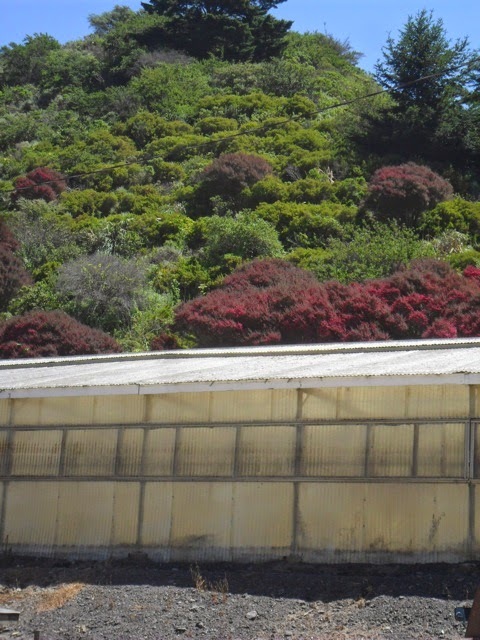 Because it is so close to the coast, you can grow all year. When God provides, He does it in style. 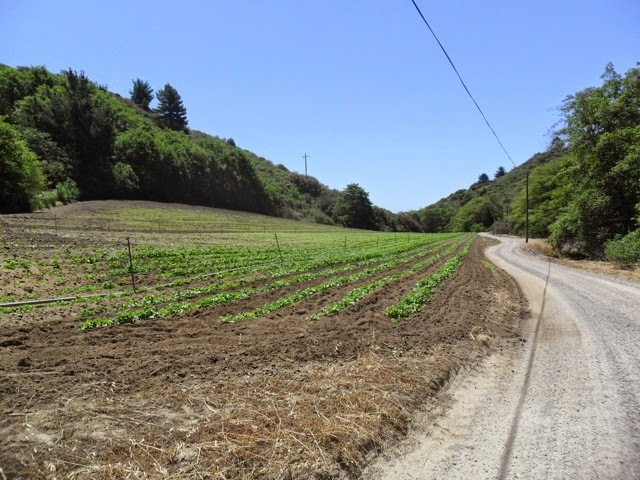 We are in escrow now and expect to own the farm sometime in the middle of August. Our idea is to make a farming-based ashram, calling it Ananda Valley Farm. We are very fortunate in that the long-time manager of the farm is willing to stay on for the transition, perhaps well into the future. He has worked there for decades and knows every inch of both the land and all the systems and equipment. A great blessing indeed. We are looking now for experienced organic farmers and also for those interested in learning, or just helping out in whatever way is needed. This is a big project. Definitely a many-hands-make-a-miracle moment! If a farming-based ashram life appeals to you, either full-time or as an occasional volunteer, do let us know. 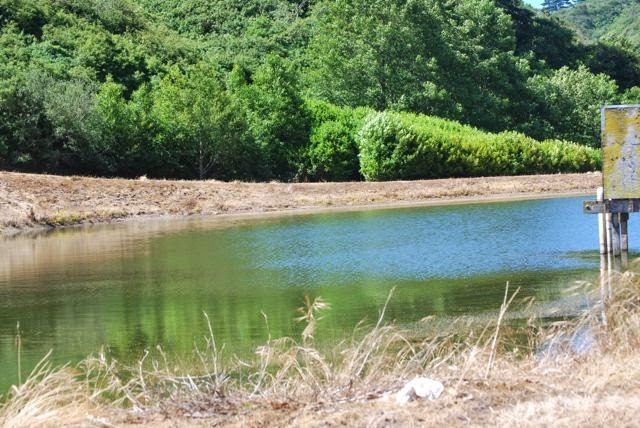 Although we have successfully managed the land purchase, there are many expenses ahead. If you are interested either in investing or donating to this project, please contact us right away. We would love to welcome you and show you around Ananda’s newest home in the Bay Area: Ananda Valley Farm. From Saturday, April 20, until the present moment — 5am here in Assisi, Italy, on Friday, April 26 — we have been caught in a whirlwind of experiences such as we have never experienced before, and could never experience again. For the past year, I, and many others have been deeply engaged in creating a movie about Ananda. I’ve written about it extensively in other letters, so I won’t go into detail here. The title is Finding Happiness, although, for some odd reason, almost every time I write or say it, I first call it Finishing Happiness and then have to correct myself. The director’s cut of the movie was done in January and I took it to India to show Swamiji. I wrote about that in detail in a letter at that time, so I won’t say more, except that he felt that it was the culmination of his life’s work, because it would launch the communities movement in the way Master had wanted, and Swamiji had vowed to do. We had no idea at that time on how many levels the word “culmination” would prove true. First credit for the making of Finding Happiness goes to Shivani, a founding member of Ananda Village and also Ananda Assisi. When Swamiji asked Shivani to work on the movie, the idea of making it seemed so far from reality that only a few believed it was possible. Shivani simply won’t take “no” for an answer. Every set back -- and there were many -- was just grist for the mill of her will power. And in the end, the universe cooperated, and we have an extraordinary movie that really is the story of Ananda. Shivani had taken this on as a very personal service to Swamiji. She wanted to provide for him exactly what the movie turned out to be: a fulfilling summation of his life’s work so that, when the time came, Swamiji could leave this world with certainty in his heart that he had fulfilled Master’s commission to him. “You have a great work to do,” Master told him. As Swamiji said, after viewing the movie, every aspect of what he has done is contained there. Just a few weeks later — Sunday, April 21, 8a.m. in Assisi, Italy — Swamiji did merge into the Infinite. Indeed, his work was done. Although the formal Ananda “launch” of the movie is set for the end of July, and the public launch of it won’t be until September, it was agreed that each of the colonies could have a preview showing as soon as the DVDs were ready. As it happened, in Palo Alto, our annual members gathering was set for April 20, the movie was ready in time, so the first showing happened at 5pm on that day. The response was everything we hoped for and more. Of course, it was a family audience, but an astute and honest one. We have great hopes for the worldwide reception of Finding Happiness. This is all by way of prelude. After the showing, our gathering continued for a couple of more hours, then, deeply satisfied we made our way home. The anticipation of the preview had exhausted me, and I fell immediately asleep. Two hours later, I suddenly found myself wide awake and was sitting reading at 11pm when the phone rang. “What does that mean?” I demanded of Devi. But she knew nothing more. A few minutes later, Kirtani called. “Swamiji is free,” she said simply. Despite the late hour, we began to call people to let them know what had happened, eventually walking from door to door in our community waking people up with the news. We gathered in our community temple to chant, meditate, pray, and talk quietly together about this momentous, and unexpected, change. Still, it happened so quickly. Within 15 minutes of showing distress, he was gone. Peacefully. Gracefully. Master called and Swamiji went with him into the Infinite. I have to say, this was a situation I had never envisioned. Not the fact that Swamiji would leave his body. That I have been thinking about for many years. He has been so close to the edge so many times. But somehow I always thought I would be there when he breathed his last. It wasn’t something I felt I necessarily needed. I just thought it would happen that way, that we would have enough notice to travel to wherever he was and say a final good-bye, and perhaps help with our prayers when the moment came. I’ve always kept my passport up-to-date and virtually in hand for that reason. When it had to be renewed, even though it may have seemed a little foolish, I paid a high premium to have it done in 24 hours. And I prayed intensely that Swamiji would not choose those hours to depart. I had never thought about this scenario. So we had no answer for Kirtani. But a few hours later, it was obvious to David and me that we needed to leave for Assisi, as soon as we could. In the meantime, after an almost all-night vigil, we had to plan a Sunday Service dedicated to Swamiji to respond on the divine level to this life-changing event. Grace descended, and through the morning and afternoon we drew together as a spiritual family. By Sunday afternoon we marveled over the events of the last 16 hours. The experience of watching Finding Happiness just the evening before had been a time of profound unity, celebration, and deep appreciation for the power and blessing of all that we -- the entire global spiritual family -- have done together, due, above all, to the inspiration and guidance of Swami Kriyananda. Just hours later, in the dark of the night, we were in the Temple trying to absorb the fact that Swamiji had left his body -- not left us, but left his body. A new era had begun. Before we left for Sunday Service we had plane reservations to fly to Italy on Monday morning. Then we cancelled those and made new reservations for a more suitable itinerary. Then we noticed we were paying twice what we should, so we cancelled those reservations and finally set the trip in the right way. It was not a significant in itself, but symbolic of the swirling energy and feelings of that day. Almost all the colony leaders from India and America were coming to Assisi, plus a number of others who also felt drawn to be there. Over several hours, on Tuesday morning, starting at 7:30am, about 15 of us from America, on several different flights arrived at the airport in Rome, which is about 3 hours by car from Ananda Assisi. Every other time that we have come to Assisi, it has been to see Swamiji. I am accustomed to living away from him. It has been many decades since I lived in the same community. For years we haven’t even been on the same continent. When I am away from him, I don’t feel deprived. But when the time comes to see him again, I am impatient with any delay. “Enough already” is my inner attitude! Let us go NOW to wherever he is. We were in the first wave, and just as we were about to get into the elevator to go pick up the rental car, we saw Kirtani in a nearby coffee shop. Immediately we went over to greet her. She and Anand had come to pick up Jyotish and Devi. An elaborate system of renting cars and being picked up had been worked out the night before. It was more practical to drive in a caravan, since no one except Kirtani and Anand were certain of how to get there, but we also waited for everyone to arrive because there was no reason to hurry. The opportunity to be with Swamiji, which has been the central point around which my life has orbited since the first day I met him in November 1969, had shifted. We could sit for hours in the Rome airport, being with our friends, greeting others as they arrived, for there was no compelling reason to be anywhere else. I have not been touched by death in the way many have. My parents have passed away. Dear friends have gone to the astral world. I am deeply steeped in the teachings of Self-realization, though, so I know they have simply gone on to another reality. They are not “lost,” just out of sight for now. But it isn’t really because of the teachings that I feel I have not been touched as others have. The reason is more mundane. Much as I have loved those who have left this planet for another world, our lives were united on the spiritual level, but not in a day-to-day way. So their absence, though heartfelt, was not so acute. I could simply be happy for them in their new adventures without any thought of myself. Not so with Swamiji. Even though I live many months of the year away from him, the times with Swamiji have always been the defining reality of my life. In between, I carry out my duties with joyous, creative, enthusiasm. I feel him with me, so I am not lonely, I don’t feel separated. But when the opportunity does come to be with him -- those moments are like the pearls on the thread of my life. Now, in the Rome airport, in the tiniest way, the fact that we could sit for hours without any sense of need to be somewhere else, was the first tiny opening of the door into the rest of my life. No surprise that all of us were still operating under a sense of unreality. Even Anand and Kirtani, who had been with Swamiji when he breathed his last, had been so caught up, as all of us were, in giving services and helping others that we hadn’t begun to integrate this reality into our own lives. Now it was starting. Within a few hours after Swamiji’s passing his body was moved to the Temple. Day and night since then there have been people meditating there. Italian law required that the body be embalmed, so it was possible to keep the casket open. Silently we walked up the stairs and down the pathway to the Temple. A body after the soul has left is so still, so peaceful, and in Swamiji’s case, so beautiful. He was dressed in a deep blue Nayaswami robe we had seen him wear many times before. His feet were bare, his hands gracefully, elegantly resting on his abdomen. His eyes were closed, his mouth slightly open. He wasn’t in the body, but he was in the Temple. Unmistakably present. Despite jet lag and all that had happened since Saturday afternoon, we sat down immediately and meditated for a long time. That night there was informal sharing by community members of their experiences with Swamiji. The next day, Wednesday, was a memorial service. The Temple was completely filled, with many sitting outside the open windows on the surrounding deck. Seats had been arranged in the front row for all the colony leaders. I was already seated when Jyotish and Devi came in. Many years ago, Swamiji announced that Jyotish would be his spiritual successor. For many years, he and Devi have been leading worldwide Ananda with inspiration, grace, and wisdom. But this was different. I stood in respect for him, as we have long done for Swamiji. For the last several years, Swamiji has been taken care of by Narayani. Her duties with him have been all-consuming, especially as Swamiji’s body has declined. During the Memorial Service she spoke and it was deeply touching to hear from her about Swamiji’s passing and the time immediately afterwards. Kirtani, Anand, Jyotish, Devi and I also spoke. And there was much beautiful singing and chanting. That service was recorded and is online so you can see it for yourself. Many people spoke in English and then were translated into Italian, or if they spoke Italian, were translated into English, so you can understand everything. At the end, everyone came forward as we chanted and each put rose petals into the casket. By the end, only his face and feet were showing. Swamiji was not in his body, of course, but now there was enormous life force in the casket, created by the deep love and devotion of all the devotees. That day and the night before so many people spoke of how close they felt to Swamiji. To each he was their best friend. During his lifetime he appeared to be outside of us, but his consciousness united with something deep within our hearts. The love he gave us was the love of God. That talk, along with an English translation, has also been posted on the Ananda Assisi website. Swamiji’s house here in Assisi is called Seva Kutir. As you have heard from other reports, he was lying on his bed there when he breathed his last. Spread out now on his bed are the robe he was wearing, the shawl that was under his feet, his slippers, and the other things he had on his body at the moment of passing: bangles, rings, watch. Narayani and her husband Shurjo live in the downstairs bedroom. Jyotish and Devi are also staying at Seva Kutir. When Swamiji was not in Assisi, Kirtani and Anand would stay in the downstairs room and the house would be used for community events. That will continue. Swamiji’s room was not used except by him. Now it will be a shrine and meditation room for everyone. We came to Assisi also to be with our fellow colony leaders, and yesterday we gathered at Seva Kutir, first to have a long meditation in Swamiji’s bedroom, then to talk together in the living room where we so often sat with him. By the grace of God, I have been able calmly to carry out all that had to be done since that call came at 11pm on Saturday. As I explained at the Sunday Service the next day, I have been preparing myself as best I could for this moment for many years. If only Swamiji was one of those yogis who lives for centuries! But it was clear he was not. Even after I arrived in Assisi, even seeing Swamiji’s body, the fact of his absence, on some level, had not really sunk in. It was only when we went to Seva Kutir that it finally entered my heart with the finality only death carries. Although it was a joy to be in the place we had so often been with him, it was also, in the end the place where my heart broke. So many people have been so kind to me, comforting me as a daughter who has lost her father. Which I am, as are all of us -- Swamiji’s spiritual children, brothers and sisters in the Guru. 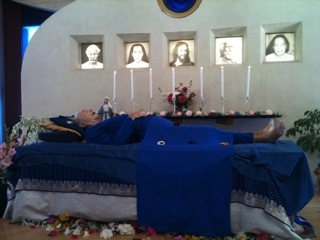 Now our beloved father, after a long lifetime of continuous giving, has gone into the Infinite. All of your kind words and affections I have received, appreciatively, but without truly receiving them in my heart. I didn’t yet need them. Now I do, and I have received them, and I am deeply grateful. Or from me, or from any of us. We all remember how Master wept at the funeral of his beloved Sister Gyanamata. “Dear Sister,” he cried. And at the same time, through his tears, spoke of how he saw as she was absorbed into the Infinite. We live on many levels. “I will never see Swamiji again.” That is a fact that has to be faced. How often has Swamiji said, “We have to deal with reality.” And I am. And at the same time... well, it has to be faced. I will never see him again. The tears, for the moment, have passed. I pray they won’t return. If they do, I will live through it, but it is not the response Swamiji would want from us. Nor is it the truth as I well know, and could also explain eloquently. But sometimes heart and mind and spirit divide into several pieces, and one just has to wait patiently until they knit back together again, as they will. This letter about Swamiji’s passing began with news about Finding Happiness and will now also end with it. Somehow the completion of that movie and the completion of Swamiji’s life are intertwined. Shortly after writing most of this letter, almost 300 of us went to a nearby movie theater to attend the preview showing in Italy of Finding Happiness -- with Italian subtitles. Watching it again, seeing Swamiji speak and laugh and move on the screen was particularly poignant, inasmuch as we have most recently been spending time with that same body, but absent the animating spirit we saw on the screen. And even though there was notable unfolding of tissue, and wiping of tears, it was impossible not also to be joyful -- utterly filled with joy -- to see the beautiful expression of all that we have done together in fulfillment of Master’s dream. I think these three video and photo links from Assisi tell the whole story. The first video is Miriam telling the story of Swamiji’s last half hour in this world. You’ll see some of the facts shared at Sunday service were not quite accurate. Anand and Kirtani arrived earlier than we thought and were there with Swamiji for the last 15 minutes of his life. We also have this set of beautiful pictures from the Astral Ascension ceremony, as well as the following video. Deeply moving. Swami Kriyananda, aged 86, Ananda’s much beloved founder and spiritual leader, left his body and merged into the Infinite last evening (April 20) at 11pm Pacific time. 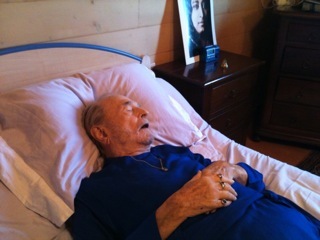 He died in his home in Assisi, Italy (8am April 21 there). For several weeks he has not been feeling well and has spoken frequently about how difficult it had become for him to work through that body. He gave many hints that he might not be with us much longer. Still, his actual passing came peacefully but without much warning. He had gone to bed early Sunday morning, about 2a.m. and got up at 7. He put on his robe and went from his bedroom to the dining room where his computer is also set up. He checked his e-mails, as he always does first thing in the morning. Jaidhara offered him pancakes for breakfast and he nodded approval, but didn’t speak. When Miriam, his nurse, asked how he was feeling, Swamiji didn’t respond. At first she thought he was just withdrawn but then realized something else was wrong. He had a brief seizure, just a few seconds, but seemed to be recovering. Then he had increased difficulty breathing. Shurjo and Narayani were also there with Swamiji. Anand and Kirtani were in the temple meditating and someone ran to get them. Swamiji continued to have difficulty breathing and those who were present began to chant AUM in his right ear, at the same time encouraging him to breathe. They moved him from the dining room to his bedroom. He lay on the bed struggling to breathe while they chanted AUM in his ear. Anand and Kirtani arrived. About 15 minutes later, he partially opened his eyes, very briefly and looked at Narayani who was standing closest to him. Then he closed his eyes, exhaled, and everyone in the room knew he was gone. Swamiji has fulfilled in every way his Guru’s commission to him. He has done the great work Master asked him to do. He has faced death, and now he is with God. His body will be placed now in the Temple of Light in Assisi so everyone there can come and meditate with him. Jyotish and Devi are going to Italy right away and there will be a service there for Swamiji. Several years ago, Swamiji requested that after he died his body not be cremated, but brought to Ananda Village and buried there. A Mahasamadhi Mandir will be built over where his body is put and some plans have already been made to do this. We have been deeply blessed to have had so many blessed years of Swamiji’s guidance and inspiration. We rejoice with him now in his perfect freedom in God. Sunday Service will be dedicated to Swamiji. A photo of Swamiji taken shortly after his passing. At rest in front of the altar in the Assisi temple. Forgive me for taking so long to write to you all again. For the last three weeks I have been giving classes almost every day, first in Kolkata, followed by Delhi and Gurgaon, with brief visits to our centers in Rajouri Gardens and Noida (both in the Delhi area). Meeting so many new people, and teaching everyday seemed to use up most of my communication energy. Thus the long silence. I haven’t seen Swamiji since he left Kolkata. Jyotish and Devi have written about their time with him since then, so all the news here will be about my travels. And even though this has been a joyful and expansive time for me, I am not sure how much of it I can put into words. I have sometimes spoken about the Nation of Self-Realization, which I believe is the true citizenship of all of Master’s children, no matter what official passports we carry. But it is quite another thing to come to the other side of the world and meet your brothers and sisters in God, and feel such kinship, even though we are meeting (in this lifetime) for the first time. The illusion of nationality and culture is dissolved by shared discipleship and love for God. The Kolkata talks went very nicely. As I explained in my last letter, we did one class a day for about 6 days and the magnetism built every day, even though not everyone came every day. By the end, we were all quite comfortable together and that sense of family made it all deeper and more fun. The uncertainty I had at the beginning about teaching in India has dissolved and I feel as much at home here as I do in California. Most of all, what I am aware of is the privilege of sharing Master’s teachings, Swamiji’s inspiration, and the joy of seeking God. Now a few details, just so you can have a picture of what these weeks have been like. In Kolkata, we held almost all our programs at the Birla Planetarium. Alas, not in the round room with the stars above, but in classrooms arranged around the outside. It is centrally located, and quite a nice space in which to teach. For a while I was staying in a hotel that was within walking distance. It is winter in India, and in the Delhi area the weather is quite pleasant. The 20-minute stroll through the crowded, noisy shopping area to reach the Planetarium was a pleasant spiritual exercise in staying calmly centered in myself despite the bustle around me, and also in dissolving inner boundaries, seeing and feeling God in all His various forms, including my own. After Kolkata, we flew to Delhi. It turned out, there were no other demands on Bryan’s time, so he came with me, and was able to stay through the whole rest of the program. There was fog in Delhi so our plane was delayed for hours. His company is delightful, so we sat on the floor of the airport and chatted happily for half the day. He has also been able to make videos of all the classes. They’ll be posted on Ananda India site and also Ananda Palo Alto. I’ve been talking faster than he can edit and upload, but soon they’ll all be there. Ananda started in 2003 in one house in Gurgaon. In those first years, Biraj and Lahari traveled at least once a week, for almost 2 hours in a car, to a city called Noida on the other side of Delhi to nurture a group there. The soil of devotion was rich and the result has been a thriving center ever since, led by Mr. M.B. Gupta, a deeply devoted disciple. Another group started in an area near central Delhi called Rajouri Gardens. Although most of the people in the center also speak English, all the teaching is done there in Hindi (except, of course, when someone like me comes in who can only speak English). Both Noida and Rajouri Gardens have a permanent, dedicated center, beautifully set up, with a deeply uplifting vibration. I went to Noida twice and to Rajouri Gardens once and for me those experiences were among the deepest that I have had in India. There was some karmic link, either with the places, or, more likely, with the people, that lent a unique quality to the evenings. I am deeply grateful to Master and to all the devotees for the time we shared together. At Rajouri Gardens the topic they wanted was Raising the Kundalini. There had been some shifting of titles and I confess to having been a bit inattentive to the details of my program, so I found out in advance, but not that far in advance. Since my talks come out of the inspiration of the moment, it didn’t matter, but it was interesting to balance the deep feeling of devotion in the center with this more metaphysical topic. But God finds a way and I think we all enjoyed ourselves and felt the evening was worthwhile. 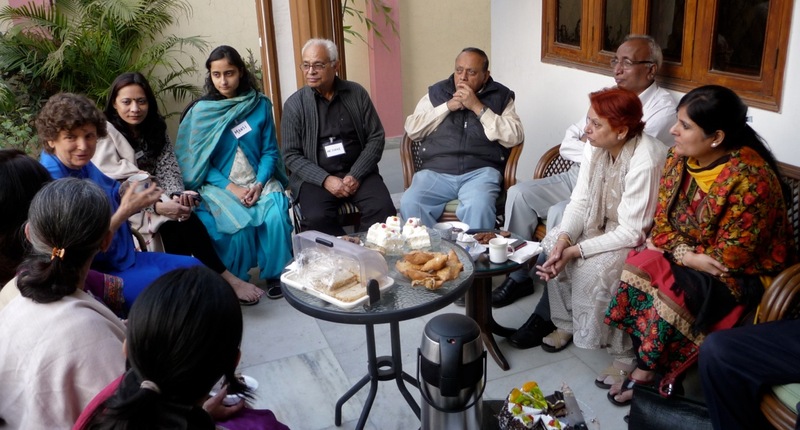 In Noida, I was invited for lunch with the core members and then a satsang afterwards. Mr. Gupta and his family live in a beautiful flat on the top story of a relatively new development in an area called Greater Noida. It is some distance from central Delhi where we were staying, but some of the devotees came to pick me up and talking about God, Guru, and the spiritual path makes time pass effortlessly. Nowadays, there are fine highways all around the Delhi area, so travel is different from America, but not so different as it used to be. The way housing is being constructed in this area is in defined communities, with multistory apartment buildings surrounded by walkways and perhaps, gardens. Some complexes, like where Mr. Gupta lives, include hundreds of apartments, but in this with lots of beautiful common space where people walk, and gather, and the children play. Quite lovely. A few days later, I went to do the Sunday morning satsang at the center itself, which is a few kilometers from Mr. Gupta’s home. For that event, I went on Saturday night and spent the night in the home of two devoted members, both doctors. The ground floor and basement of their house is a medical clinic; the family lives on the upper two stories. This was in a more established neighborhood of individual houses, rather than the newer apartment complex where Mr. Gupta lives. The devotees hosted me with such love and care. I felt as if I were in my own home with my own family. In the morning we had a deep meditation together in their temple room. We are all citizens of the Nation of Self-Realization. It couldn’t be more self-evident. There is something about these neighborhoods and Indian homes, with the narrow streets, and the buildings close together, the balconies and marble floors, the indoor-outdoor living that touches some deep memory within my soul. A very happy memory I must say. Mr. Gupta decided to celebrate Master’s Mahasamadhi a week early, so our Sunday Satsang included a flower offering and a blessing ceremony. Every altar here is lavishly decorated with fresh flowers -- garlands and bouquets. So lovingly done. Having such a devotional theme made the morning utterly blissful. As it turned out, that was the last public program for me in India. I couldn’t have imagined a more fitting way to end this tour. Now, back to the airport in Kolkata, to give you some of what happened before that final event. Eventually the plane took off and when we got to Delhi we were met by Daya, who, with her husband Keshava, runs what is now the Delhi center. For years, Daya and Keshava have been guiding this center in central Delhi, even though they lived about an hour away in Gurgaon. Last fall the decision was made to move full time into Delhi. By the grace of God they were able to find a perfect location. Land in Delhi has skyrocketed in value. On one small plot people can build a four or five-story building, each floor its own flat which can be sold for an enormous sum. So they were astonished to find a single story house with a garden right in the middle of Delhi. The owners had been transferred to another city and the house was for rent. It is on a narrow, but quite busy street, between two contrasting neighborhoods. On one side, is an established area of individual homes, built around a large park. It is an older neighborhood, with many large trees. The street fronting the house where Daya and Keshava live is extremely noisy with cars, and motorcycles and constantly honking horns. You step through the gates of that neighborhood -- just a few minutes from their front door -- and it is suddenly quiet and tranquil. And the park is an ideal place for a morning or evening walk. Go the other way out their gate and you come into an old traditional neighborhood. Even though the property is of great value, the government also protects these older neighborhoods from being exploited. Generations have lived there. It is, in a real sense, an urban village and few living there want their community disturbed. In that direction, a few blocks away, there is a beautiful Jain temple, and along the way one passes a temple to Sirdi Baba, and a small Krishna temple as well. All around there are small shops, and smaller dwellings, and the usual bustle of Indian life. The house where Daya and Keshava live, along with Sangeeta, one of the earliest Ananda members, who now runs the publication business, is about the size of the ground floor of Chela Bhavan, for those who know our house in Palo Alto. And the garden is about the size of the back yard. All of it, though, is walled in, either by the adjoining buildings or freestanding walls. Once you come in the gate from the busy street, you are entirely in your own world. Everyone is astonished to find in the middle of Delhi a house and garden of this type. The house has a large living room, which has become the Temple for the Delhi center. And the garden provides outdoor space, which, especially during this season, is an extension of the house. Near the gate there is another small building which houses the publications office and the kitchen. We slept inside, but took all our meals, and our morning tea in the garden. I have heard it said (I don’t know how reliable the information is) that in the astral world sometimes you are given a home that matches you imagined ideal. I think in the astral world I lived in a house very similar to the Ananda Delhi center! 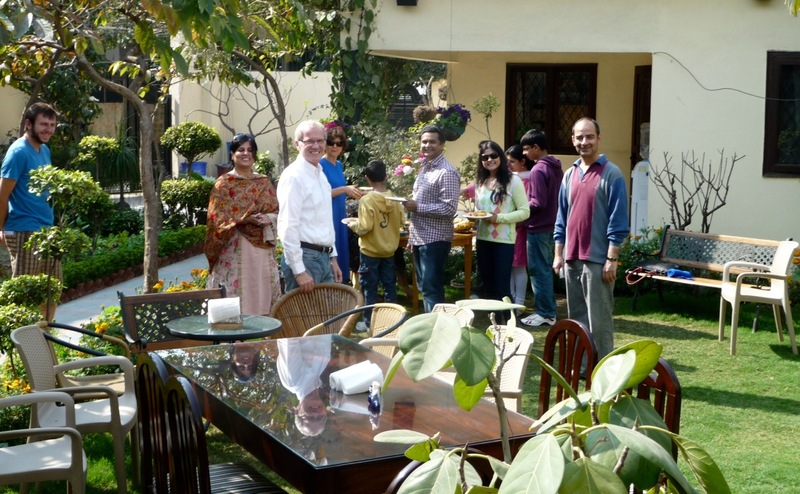 Daya, Keshava, and Sangeeta were the perfect hosts and for almost a week we had a delightful time together. And, oh yes, we had classes every day, and informal gatherings as well. The group is wonderful. I feel very at home with the devotees in this area of India. Every event was at the center except for one. For that we rented a hall nearby, right across from the park where we took our daily walks. They did a lot of publicity for that one and we had a good crowd, about 130 or so, and at least 1/3 were people we didn’t know. We are experimenting to see how, in future, to reach out beyond our own crowd. It went well and bodes well for the future. Bryan stayed at the center also. He had a slight cold, which, in our conversation, we exaggerated to life-threatening proportions, planning to use it as an excuse to stay in that house forever. Teatime entertainment was the composing of various telegrams (although no one sends telegrams anymore, but the “plot” worked better as a telegram) was that Bryan was “too sick to be moved” and all plans had to be cancelled until his recovery at some date in the future yet to be determined. All a pleasant fantasy, I hasten to add. Bryan is fully recovered, and when our scheduled departure day arrived we bade a fond farewell to our Delhi home and drove away in the taxi. Our next destination could hardly be called a hardship duty! One of the reasons they decided to move out of the house in Gurgaon was because the center, which had been in the basement of that house, was able to move to a much more public, and expansive location on the top floor of a local community center. These are a feature of all the neighborhoods here, constructed at the same time as the houses themselves. There are large meeting halls for weddings and other ceremonies and events. In this particular building, the ground floor is used by the area residents, the top floor is entirely dedicated to Ananda. Spacious, airy rooms, a terrace, an outdoor lawn. Simply wonderful. Very attractive, easy to access, entirely quiet, lots of parking. When Swamiji arrived, they were able to rent for him a beautiful house which is a half a block from the center. When Swamiji isn’t here, Dhyana and another devotee live in the house. And there is also a perfect guest room. That is where I am staying; Bryan is housed with friends nearby. Once again we’ve had daily classes and the group has been wonderful. I don’t mean to endlessly repeat superlatives, but there are no other accurate words. It has been a joy to meet so many fine, dedicated souls. 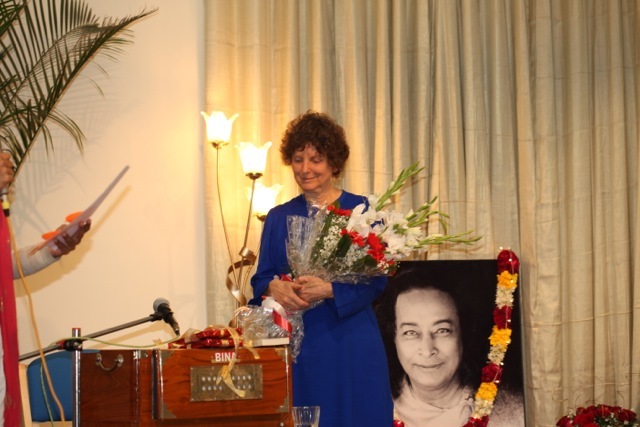 I am deeply grateful that Swamiji suggested that I come to India and share in this way. It has been both a privilege and a joy. I’ll be there for a few days, including the weekend celebration of Master’s Mahasamadhi. A big crowd is coming, including the 30 Americans traveling with Hriman and Padma on pilgrimage, so it should be a joyous event. Swamiji is scheduled to fly to Europe on Monday, March 11, and on the same day I leave for California. He has had some challenges to his health, but he seems to be recovering well and we are all praying that he will be able to travel as planned that day. My heart has begun to move ahead of me back to California and I am eager to see all of you there. P.S. We have a few more photos from these last couple of weeks posted online. I am almost in the exact middle of my time in India. I left California January 13 and arrive back March 12. Tonight my talk (I am in Kolkata) is on Spiritualizing Relationships. Apparently it was a happy accident that it is scheduled for Valentine’s Day. This is a new holiday for India, coming in, like so many other aspects of modern India, through international corporations: in this case, Hallmark Cards. Or at least that is what an Indian friend told me, describing how, out of nowhere, her mother suddenly expected her father to remember the day with flowers, when he didn’t even know Valentine’s Day existed! A characteristic feature of Dwapara Yuga is one-world culture. Maybe not all aspects of that one-culture are equally desirable in this transition from Kali into Dwapara, but the global channels are opening and as the consciousness improves, the conduit for a global culture is in place. That’s how I make good news out of what otherwise could be seen as a depressing spread of the worst of the West into the East...! Last letter was written from Pune. Now I’ve been a week in Calcutta. Let me backtrack a little first. The work in India is suddenly expanding in all directions, with a new center in Bangalore, led by Haridas and Roma, and soon Dharmaraj and Dharmini will come to start a center in Chennai. Jyotish and Devi will be spending more time in India, Jaya will be dividing his time between California and India, Tushti and Surendra are leading the Pune Community -- time to get organized on a bigger scale, to set priorities, manage expansion, work appropriately with personnel. Which was all the subject of very creative meetings in Gurgaon. When Swamiji came to India in 2003 he quietly stated that the Indians would embrace Master’s teachings with such enthusiasm that eventually Ananda’s work here would “dwarf,” by comparison, everything else we are doing. You can see the seeds are planted and the green shoots are sprouting everywhere. Swamiji decided to carry on this multi-city tour, and even though he may visit one or two cities when he is here next fall and winter, his body simply isn’t up to this kind of traveling for much longer. With his divine consciousness he has “registered his words in the ether,” now it is up to others to cultivate what he has planted. And the team here is working beautifully to do just that. The ideal way from now forward for Swamiji to serve is through television. Programs that are already recorded, or perhaps new ones that he can make more easily than he can travel from city to city, will soon be appearing on national stations. When he first came to India that is what largely put his name and Ananda’s work into the public consciousness. Eventually, though, the expense of the television program was more than Ananda could cover, given the cost of starting the community in Pune. Now it seems, that the television shows can be started up again. Without leaving “home,” wherever home happens to be at the time, Swamiji can broadcast Master’s message everywhere in India, every day. Definitely the way to proceed. As all of you know, Ananda is developing also now another way of sharing Master’s teachings: movies. Finding Happiness will be finished in another month or two and have its formal public release next September. Before that, there will be an Ananda release in various places, including the big event in July at the Village. The second movie, The Answer, based on The New Path, has been getting underway even as Finding Happiness was getting finished. Vivek and Cecilia Sharma, who live now in Gurgaon, and Nandini in Italy, have been spearheading the project, working on every aspect of the movie with great dedication for many, many months now. Kaveeta Kaul is the producer and the director is Pavan Kaul. They are both devotees of Master and have been in the movie business here in India for many decades and bring all their experience, talent, and devotion to this project. The plot is as follows: a young Indian man is searching for truth. He has read the Autobiography of a Yogi in his teens and felt great love and devotion for Master and for many years kept that book with him as a constant source of inspiration. But his Westernized education, through the college years especially, gradually drew him into another vibration, and the Autobiography was placed on a shelf and rarely opened. That way of living and thinking, however, became increasingly unsatisfying, and one day in Kolkata the man -- called “Gopal” in the movie -- sees a poster for a talk by Swami Kriyananda. As it happens, the very program Swamiji gave a few days ago. Suddenly remembering his early devotion to Master, Gopal has a resurgence of hope that there is, in fact, an answer to his seeking. In the film, he goes to Master’s house at 4 Garpar Road to renew his devotion to Yogananda then comes to hear Swamiji speak. Filming for this movie began a week ago. Because I thought it would be great fun to see how things are done in India, I got myself invited to come along for the first days of filming. Gopal is played by Shurjo Jha, a longtime resident of Ananda Pune, now married to Narayani. His own story doesn’t quite parallel that of Gopal, but it is close enough for Shurjo to be a natural in the role. Bryan McSweeney is doing the behind the scenes filming, the way Dave Bingham did for Finding Happiness, so the three of us took an early flight from Pune to Kolkata last Thursday. Cecilia, Vivek, Kaveeta, and Pavan also came to Kolkata and all of us met that evening at 4 Garpar Road to talk to Sarita and Somnath Ghosh, to look at the house and to make plans for the filming the next day. Nandini had hoped also to come to India, but her schedule wouldn’t allow it. It has been many years since I have been to that house. As always, the vibrations of Master permeate every inch, and go right into your heart and soul. Very moving to be there, and especially so under these circumstances -- working on something that will bring Master’s message in such a creative and dynamic way to the whole world. The next day at noon, as per our arrangement with the Ghosh family, we met again at the house. First Pavan filmed Shurjo arriving at the outside of the house, looking at the building, the address, the plaque on the doorway saying that this is the house where Paramhansa Yogananda lived. Shurjo conveyed the spirit of a seeker perfectly, even without words. His face, his body language, even his walk, were just what it should be to give the viewer a sense of what was going on inside him. Pavan has a very sophisticated video camera that looks more like a large still camera, but has a special lens, and a great capacity to draw in ambient light, so he filmed without any special set-up, but just as Shurjo walked down the street, Pavan and his colleague, each with their own small camera, took the footage. Because of the nature of the scenes, this was the ideal way to do it. They were filming life as it happened with Shurjo in the middle. Any kind of complicated set-up, or even a larger camera would have been impossible in the situation. For later scenes, larger cameras and more deliberate lighting will be appropriate. This film, like Finding Happiness, is being done with state of the art equipment in the way any fine film would be. Actually, Bryan was the one explaining to me about the camera Pavan was using, telling me what an innovation it has been for filmmakers to be able to make top quality films with something that you can hold so easily in your hand. Envy is not a spiritual quality, so let us say simply that Bryan deeply admired Pavan’s camera. I watched both the viewfinder and the small video screen wired into the camera and the scenes were beautifully framed and naturally lit and very touching. You could feel from the first shot the presence of Master in the whole project. Inside, Shurjo was filmed going up the two flights of steep stairs, the very same stairs Master and his siblings undoubtedly ran up and down countless times a day. Just climbing those stairs for anyone sensitive to Master’s vibration is a devotional experience. Shurjo/Gopal carried it off beautifully, and the shifting light from the various windows made great footage. In front of the small attic room where Master found God, as he describes in Autobiography of a Yogi, again Shurjo/Gopal expressed (all of this part of the film is without words) the intensity of feeling of Master’s vibration there. Before the indoor filming started, we had a ceremony in the small attic room. All of us crowded in together, including Bryan who, with his camera was filming the filming, and we took the official “first frame” of the movie at the auspicious moment. Swamiji had written a beautiful prayer for the occasion, asking God and Gurus to bless the project, and to make all those involved instruments of his light and joy. We had the “clicker,” the board on which the scene is written marked with the Hindi word (which, alas, I have forgotten!) which means the auspicious beginning. We chanted a few songs, clicked that board, then took the appropriate film to officially launch The Answer. Then we went downstairs into the courtyard and broke a coconut. This is always done at the start of a project. The hard brown shell of a coconut is not that easy to crack. Breaking it open symbolizes the ability to overcome all obstacles. Shujo did the honors and since it is best to break it cleanly and well on the first try, he threw it to the ground with sufficient force, to splatter himself with coconut milk, and shatter it into lots of pieces. Obstacles beware! No chance to derail this project. Then we ate coconut and sweets and The Answer was officially launched. A much nicer tradition than breaking a bottle of champagne, for example, on the bow of a ship! Filming at 4 Garpar Road only took a couple of hours. The rest of the day the crew, with me as a tag-a-long, went to various iconic locations within Kolkata just to give some local color and a sense of Gopal’s search. He and the two cameramen, for example, stood under a large statue in the center island of a five street convergence somewhere in the heart of bustling Kolkata. Over and over Shurjo/Gopal crossed and re-crossed the street, stood near tram-tracks and watched the cars go by. Bryan and I stood on the sidewalk, he filming, me just taking in the unique reality of Kolkata. There is nothing else like it for sheer variety! Later, after dark, similar scenes were filmed in another part of town. These will only be briefly shown, but will add a great deal to the feeling of the movie. The next day, Shurjo/Gopal was filmed on a boat going under a bridge, and shots were taken from the top of a high building, and they also filmed in a district where statues of Divine Mother are carved and painted. On the day of Swamiji’s talk (more about that later), they hired two other cameramen and also a sound recorder to film the event. In the movie, Gopal goes to see Swamiji and that is the pivotal moment in his life. Shurjo/Gopal was sitting in the audience and his reactions to Swamiji’s talk were filmed, plus the talk itself both recorded and filmed. Swamiji always leaves quickly after a talk. Otherwise the devotees present surround him, as I explained in my last letter, and it is impossible for him to leave for a very long time. On this occasion, too, as soon as he finished speaking he left the hall, and someone stood up to make announcements, including me, to hold the audience in the hall for a few moments longer while Swamiji left. On this occasion, it was also important because Shurjo and the whole film crew had slipped out quickly into the lobby to film an important scene for the movie. After the talk, Shurjo/Gopal chases after Swamiji and calls out to him, “I must talk to you!” Swamiji answers, it is not possible now, perhaps later.” Or words to that effect. I didn’t witness the filming because I was part of the inside the hall announcements, but Jyotish and Devi were there and said it was very convincing. For a moment everyone forgot it was a film and Swamiji was just responding to a devotee obviously in great need of his counsel. The next stage of filming was that meeting between Gopal and Swamiji, which takes place inside the hotel where Swamiji is staying. It wasn’t possible to shoot it in Kolkata for logistical reasons, so arrangements were made to do it in a hotel in Mumbai. In those scenes, Gopal expresses to Swamiji his longing for God, his experience with Master through the Autobiography of a Yogi, the unsettling effect of his Western education and all that he feels he has lost in recent years of devotion and happiness. As the answer (in The Answer), Swamiji tells the story of his own search and its fulfillment in meeting Master. The film follows The New Path. So it is all flashback about Swamiji’s early years, meeting Master, and then many, many stories about Master himself. Every so often in the story line, it comes back to the hotel room and Gopal receiving from Swamiji the answer he is seeking. In Mumbai, the day they were supposed to start filming, Swamiji woke up feeling quite unwell. A call for prayers went out around the world, and within a few hours he was suddenly quite well enough to film and apparently the scenes went very well. I have to offer this only as a “so I have been told,” because my program of classes here in Kolkata prevented my going to Mumbai. I am sure, given when I have seen of Pavan and Shurjo, and, of course, what we know of Swamiji’s extraordinary ability to convey the spirit of Master, that these scenes will be wonderful. Two other extraordinarily important things happened for the success of The Answer on the Friday and Saturday before Swamiji’s Sunday talk. Much of this movie, unlike Finding Happiness, is going to be done by actors. Shurjo is Gopal the seeker, Swamiji plays himself, and so does Narayani, but the flashbacks are of Swamiji at several different ages before he met Master, plus his years with Master. And Master himself has to be played by an actor. So much of the success of this movie depends on who plays those roles. We have actors within Ananda who may well take the part of Swamiji. But for Master, we need an Indian actor. Kaveeta decided to offer the role of Master to a well known Bengal actor named Victor Banerjee. He was born in 1946 (making him just a few years older than Master was at the time depicted in this movie) and has had a long and illustrious career internationally. In America, he is best known for the lead role he played, Dr. Aziz, in Passage to India. He is known for the depth and sensitivity of his acting. It was aiming high, but Kaveeta felt inwardly guided and her intuition proved true. Victor responded immediately to her e-mail. The first meeting went very well and the next day he came to meet Swamiji. Victor travels a great deal -- in the previous 15 days he had been in five cities, but exactly the days that Swamiji was in Kolkata, so was Victor. Swamiji liked him immediately and the decision was made. Having an actor as well known as he is, of his professional stature, is a huge plus for the film. It suddenly moves it from an unknown production, into one everyone will be interested in. Plus, Victor Banerjee has the proven ability to enter into a character and simply become the one he is portraying. Swamiji spoke of needing to guide him in how Master was. Victor, respectfully, but with the confidence of a true artist, said to Swamiji that he didn’t think guidance would be needed, if Victor does his job as he has always done it in the past. At a certain point, Victor explained, the character is alive within him, and everything that comes out is manifested from that living character and is naturally just as it should be. In this case, of course, Master is truly a living character, and his consciousness can and will inhabit Victor for the filming. As well as being a fine actor, Victor is a very nice man, humble, kind. It looks like a match made in heaven. The only remaining obstacle has been the financing of the film. Even “low budget,” as we know from Finding Happiness, is a substantial sum. And various creative, energetic people have, for many months, been putting their minds to the question of financing the movie. That question, too, was put to rest on Saturday, when a financial angel agreed to pay for the whole production! It was quite a weekend for The Answer! First, a well-known, highly respected actor to play Master. Then all the funds needed to make the movie. In the Agastya reading that Swamiji had within the last year or so, that sage said that, whereas in the past, there were many obstacles to be overcome before Swamiji could achieve his goals, now those obstacles have been dissolved and everything will flow with great ease. Certainly this film has suddenly been launched with a power and speed that is not usual for Ananda, but perhaps will be the new norm. Let us pray with all our hearts that this is true. There is so much creative work for Ananda to do for Master all over the world. May all doors be opened everywhere. Perhaps Shurjo should come to each of our communities and break coconuts! So that is all the news that I know about The Answer. Perhaps others who have been eyewitnesses to the parts I’ve missed can fill in more details. What joy. As for Swamiji’s weekend programs, on Saturday afternoon he gave an invitation-only satsang for about 100 people. It was for those who are part of the center here. It is a small group, but very devotional. Many people came from the Pune community, Dhyana came from Gurgaon, so it was a full room. It is such an extraordinary moment for the devotees to meet Swamiji, especially in such an intimate setting, where they can touch his feet, receive his blessings, and make their offerings of sweets, and food, and flowers. For about 15 minutes, that is all that happened, one after another, devotees were introduced to Swamiji by Jemal, who has been the one setting up Swamiji’s program here, with help from Katyayani and others, and also Jemal has been teaching in Kolkata from time to time over the years, with help from the other monks. One by one those who have been supporting Ananda’s work, and themselves growing deeper in it, were able to meet Swamiji in person. All of Master’s family was there also, both from 4 Garpar Road and also from Serampore. Hassi Mukerjee also came. Her health is not up to par, so it was a great effort, very touching to see her there. Then Swamiji answered questions for a time. It was a deep, and heartfelt sharing among Master’s children. The next day, Swamiji went in the morning to 4 Garpar Road. He took just a few people with him, so I heard about the visit from those who were there. Access to the house is up two flights of steep concrete stairs and it was hard to imagine how Swamiji could make it up those stairs. In fact, he had to be supported by Shurjo and Jyotish even to reach the main floor of the house. All the family was there again, and they served Swamiji lunch and honored him as Master’s representative. The disciple has become the Guru incarnate. Later that afternoon was the large public program. The idea of coming to Calcutta was a late addition to Swamiji’s program, so the largest hall they could find only seated 300. As it happens, it was just the right size. Virtually every seat was filled, but no one was turned away. Swamiji began the program by singing a Bengali song, “Will that Day O Come to Me Ma,” which he used to sing often when he lived in India so many years ago. His eyes were closed and a lifetime of devotion was in his voice. It was moment in eternity. Later, many of the Bengalis said his pronunciation was perfect. They, and all of us, were deeply moved. It was the ideal beginning for what was one of the deepest, most devotional talks about Master I’ve ever heard Swamiji give. Swamiji has often spoken of his love for the Bengali language, calling it the “sweetest language in the world,” and seeing it as a reflection of the deeply devotional nature of the Bengali people. And, of course, this is the place where Master lived. It all came to a focus in Swamiji’s sharing with us. The subject of the talk was Master himself, what he was like, his greatness as a spiritual being, his personality, the way he presented himself to the world, his consciousness, his mission. Through Swamiji we were there with Master, seeing him through Swamiji’s eyes, loving him with the lifetime of devotion Swamiji has given to his Guru. Victor Banerjee was there with his wife, right in the front row, directly in front of Swamiji. The entire talk was a description of how to bring the character alive within himself, when the time comes to be Master for The Answer. The audience seemed deeply moved, and if Swamiji had not taken a quick route out of the auditorium, perhaps he would be standing there still! Again I was invited to speak for a few moments and told people about the upcoming classes -- a program every afternoon at 5:30 pm, based on the subjects of the Wisdom of Yogananda series, plus a longer program on Saturday and a question and answer session Sunday afternoon. It turns out to be a very nice way to do, each program is only an hour and a half but as the days have gone by we have built understanding and magnetism that will make it, by the end, a somewhat in-depth teaching of many aspects of the path. The group is wonderful -- ranging from 25-40 people. Very fine souls. Some are just starting, others already Kriyabans. What beautiful children Master has all through the world. To make the week more fun for everyone, it was also arranged for people to visit various of the holy places in and near Kolkata, coming back in the afternoon for the classes. I thought I might go around with them, but it proved impractical for me to be in a bus or taxi all day and then try to have focused energy at the end of that. But that inspiration for everyone else has certainly added depth and richness to it all. I am right in the middle of these programs, 4th class is tonight. So perhaps in my next letter I can say more about being here. I realize more than two weeks have passed since I last wrote, so I have a lot of catching up to do. The last time you heard from me, I was in Goa, so I’ll start from our departure from there. On Friday, January 18, we went from Goa to Chennai. Swamiji has been traveling with Shurjo, Narayani, Miriam, and Dharana (Miriam’s husband). Tushti and Surendra had also been taking a holiday in Goa, as were Kirtani and Anand (Ananda leaders from Assisi, Italy). So we were quite a large group, which enabled us to entertain ourselves quite well during the (seemingly inevitable) several hour delay in our flight. During his months in India this time, Swamiji has been going every few weeks to one or another of the major cities, putting on large public programs, planting deep seeds of Self-realization in the hearts of people everywhere. This kind of travel takes a great deal of energy from Swamiji, and he doesn’t intend to do this kind of things for many years longer -- maybe a few trips next visit, maybe not. Now, though, he feels guided to carry Master’s message as far across India as he can. Chennai turned out to be one of the most impressive programs so far. The whole visit was well planned and well organized, led by the monk from Pune -- Devendra -- who has been visiting Chennai on a regular basis for many months. He also organized the following weekend of programs for me, but more about that later. Ananda doesn’t have its own center in Chennai (yet) so the classes are held in a place called Asha Nivas (purely a coincidence that the name is “Asha’s Place” which means the place of hope). It is a nice center, with lots of classrooms, and good support staff providing tea and vegetarian lunch as needed, even rooms where people can stay. They have a wide variety of programs and ours fit in quite well. On Saturday afternoon, Swamiji held a small satsang for the Ananda devotees both from Chennai and also those who came up on the train from Bangalore. About 100 people total. They could sit right at Swamiji’s feet and ask questions for an hour or so. This is an extraordinary opportunity for both darshan and teaching, given how infrequently they see Swamiji and how often the setting is larger and more formal. Those present deeply appreciated this opportunity, many sitting on the floor right at his feet. As always, Swamiji was kind, insightful, wise, funny, and radiant with inner bliss. Everything he does is filmed and posted on the Ananda India site, so I’ll let you experience it first hand. Swamiji’s body continues to require assistance even to walk a short distance. But once he is settled into his chair, it is immediately apparent that the divine energy flowing through him is utterly unimpeded by his elderly body. The two are separate realities for him now. The large public program was Sunday afternoon. They rented the Music Academy Hall, which is considered to be one of the best halls in the city. There are 1500 seats, in a series of ascending balconies. Some thought this hall was larger than could be filled, but the balconies could be used in sequence in case the crowd was smaller. No worries. Long before the program started the entire hall was filled. The choir went backstage to be ready to sing, and when their part was done, their seats were gone! They filed into the orchestra pit and perched there on a wooden ledge for Swamiji’s talk. Not only the seats, but every aisle and spare place inside the theater was filled. Also the foyer was jammed with people watching on a video screen, and still, many were turned away. Swamiji’s talk -- no surprise -- was far-ranging, deep, inspiring -- every good adjective you can think of just string it into this sentence. No need for me to describe, you can go online to Ananda India and hear for yourself. One man later told me that he was in the highest balcony (which was way up toward the ceiling). He was lamenting to himself that he didn’t arrive sooner. There was a video projection system, which at least gave a large film version of Swamiji, but Swamiji himself was only a blue smudge on the stage far blow this man’s seat. But when Swamiji began to speak, the man told me later, it was as if Swamiji was only inches away from him. Distance dissolved. The Presence of Swamiji filled every square inch of the hall. Because the Indian audiences are so attuned to the power of a saint, and the blessing of touching his feet, after a talk, the audience can crowd so tightly around Swamiji that he is unable to walk through to the exit door! At his age, it simply isn’t possible for him to stand and bless in the way that the people would like. He offers his blessing through the talk he gives, the music, and his presence on the stage, rather than in a personal way to such a large crowd. Apparently, when the only way to leave the venue is for Swamiji to walk through the audience, it has to be arranged in advance to create a clear corridor by asking Ananda devotees to line up on either side to hold the audience at a little distance from him. Given the size of the crowd, it was fortunate, that in this case Swamiji was able to arrive and depart through a stage door not visible from where the audience was sitting. The size of this crowd -- well over 2000 people -- was gratifying to Swamiji, not only for the opportunity it gave him to speak to so many truthseekers, but also, it seemed to me, as a sort of karmic completion. Swamiji is far beyond any personal feeling in these matters, but the forces of karma still play out around him. Swamiji first came to India in 1958, when he was still in Self-Realization Fellowship, sent by them to help develop the work in India. The story of those years is beautifully told by him in the book A Place Called Ananda. If you haven’t read it, I highly recommend it, not just as a piece of history, or for the sake of understanding the Ananda/ SRF “situation,” but because of the insight it gives you into the attitude of a disciple in general, and Swamiji in particular. In many ways it is the most personal book he has written. In that book he describes in detail the situation you no doubt have heard of at least in general terms. Of how he became extremely popular and well known in India. “The American Swami,” as he was called, regularly drew huge crowds, up to several thousand. He was in his early thirties then, aflame with love for God and devotion to Master. He was about to launch Master’s mission in India in a way that would have changed the whole country. As you probably know, at that time he received permission from Prime Minister Nehru himself for a grant of land on which to build a temple in the heart of New Delhi, the capital of the country, and, especially at that time, so soon after India gained independence, the influential heart of the whole nation. The SRF board of directors in America, however, completely rejected that plan, and eventually rejected Swamiji himself. (This story is told in A Place Called Ananda). In July 1962, he was summoned from India to New York, and dismissed from SRF. To insure that he was unable to return to India and pick up the work on his own (which Swamiji would not have done even if he were able to return) SRF planted false information with the Indian government, saying that Swamiji was both a CIA agent and a Christian missionary (!) and for ten years he was unable to get a visa to come back to India. By then Ananda in America was a going concern and the idea of returning permanently to India was not possible. This all, in retrospect, was God’s perfect plan. I am telling you all of this only to say that when Swamiji left India in 1962, he was in mid-stride in his service to Master. Everything was poised and ready to establish a great work here. Instead, he was plucked out and as a consequence everything he was doing was stopped in its tracks. Eventually he was able to visit India again, but only in 2003 did he feel the inward guidance to move back to India and take up again his work for Master in the land of Master’s birth. When he came to India in 2003, as a way of announcing the start of Ananda’s work, he wrote a small pamphlet, describing where the work was when last he was here and where he felt Master wanted it to go now. For Swamiji, it was one continuous effort, the intervening years being nothing more than an inconvenience, now, thankfully, over. That audience in Chennai -- overflowing the hall, standing room only -- was a return to the point where Swamiji was in 1962. It has taken these years to regain the momentum he had then. Perhaps I am only being sentimental about it, but it truly felt that not only was the event in itself a huge success, but it also represented a completion of a karmic circle that had to wait all this time to become whole. One of the reasons this trip for me spans such a long period of time -- 8 weeks -- is because of the timing of Swamiji’s talks. The intention in Chennai, and also in Calcutta, coming up a week from now, is for me to be introduced to the large crowd Swamiji draws, in the hope that some will also come to the follow-up programs I am giving. In Chennai, the programs were held the following weekend. Weekdays are hard because people work long hours and the traffic makes travel at the end of the day difficult. It was decided that I would speak for a few minutes after Swamiji finished his talk and left the stage. He briefly mentioned my name during his talk as a way of showing his support for the programs that I was going to offer. I wasn’t nervous about my few moments at the microphone, but I was focused. I have only spoken to Indian audiences a few times, and they were small informal satsangs, always in the context of one of our centers. So to be in a public venue in this way, what to speak of the size of the group, was new. People are essentially the same everywhere, but culture and context do influence. Mostly, I realized later, culture influences me. As it happened (more on this later, too) I had a few quiet mostly solitary days in Bangalore, before coming back to Chennai for my weekend of program. Mostly I spent these days reading Swamiji’s commentary on Patanjali. This is already published in India so it was a real treat. (Yes, I will bring home as many copies as I can carry!) Patanjali is very impersonal, and Swamiji’s commentary emphasized the issue of limiting self-definitions. In that moment in Chennai, while Swamiji was talking and I was listening to him and at the same time thinking of having to speak after him, I was quite aware of being from a country other than India. I simply wasn’t able to shed my own self-definitions sufficiently to feel entirely a part of the audience I was going to address. There was a sense, more before I spoke than during the time I was actually talking, of wondering how to bridge what I perceived to be a gap. Anyway, it made me concentrate very deeply during Swamiji’s hour-long talk. My moment came and at the last moment I realized I had to stand behind a podium that was so large I had to stand on tiptoes to reach the microphone and be seen over it. I managed to put words together with some sense of Master guiding me. At least my prayer was sincere: To share with others all that Swamiji has given to me. I also exited fairly quickly out the stage door, but many people from the audience lingered for an hour or more buying books, talking to the devotees, including asking about the classes set for the following weekend. If I had been thinking more clearly, I would have stayed to meet people. Because there was nothing for me to do in Chennai until the following Saturday, on Monday I flew to Bangalore, where we have more devotees, and a place for me to stay (other than a hotel). 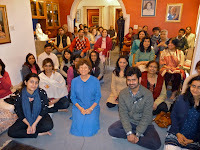 Also, we had scheduled a satsang with the Bangalore group. It was there I had the quiet days to read Patanjali. I hadn’t realized until I was able to have this semi-seclusion, how very busy I have been for months and how helpful it was to have a break. Haridas and Roma, as you probably know, shifted from Southern California to Bangalore last October. The devotees there rented a flat, which serves now as their living place and also the meeting place for the Sangha. Teachers from Ananda have been coming to Bangalore almost on a monthly basis for many years now and the group has really come together, to the point where they can support a dedicated center and two full time acharyas. It is a wonderful assignment for Haridas and Roma, really a match made in heaven for all of them. On Thursday, I gave a satsang for the group there in the center. There are many Kriyabans, and devotees who have been with Ananda for some years now, plus, of course, the devoted, uplifting presence of Haridas and Roma. All the ingredients for a wonderful evening. And at least from my point of view, it was. There is an innate spirituality India that is not found in other places. In his poem, My India, Master writes with such devotion about his love for this country. And being here for any time at all, despite various inconveniences, it is obvious why he feels that way. The next day, Friday, I flew back to Chennai. Devendra, the monk who organized everything there, met me at the airport. I’ve been in India many times but before this trip, I don’t think I ever traveled alone here. I have always enjoyed traveling alone, whether across California or across the world. To be away from everything that is familiar, in a situation where no one knows who you are, or anything about you, in terms of self-definition, I find it quite freeing. Even more so since reading Patanjali and gaining an deeper understanding of the extent to which self-definition limits our consciousness. Of course, these days, I have a cell phone in my pocket pre-programmed with the numbers of dozens of friends. I have a computer with a data stick to get me on the internet everywhere. I have both my ATM and my Visa card. Not to mention 20 kilos of luggage! So I am hardly the wandering sadhu with nothing but his blanket and begging bowls. Still, I find travel a delightful opportunity for expanding consciousness. Even now, just as an exercise, when I said at breakfast, “I am writing a letter home,” I quickly corrected myself. “I am writing to California.” The only limiting definition any of us should accept is that we are devotees of God and Guru. Let everything else go, not literally, but in terms of self-definition. Since I am talking here about traveling alone, I remember some years ago flying to India on Asiana Airlines, which had a long layover in Seoul, South Korea. Alone in that airport for several hours, I tried to think what I would do if, for some reason, global transport and communication collapsed and I had to create a life for myself in South Korea starting from nothing at all. It was expansive and fascinating, and, fortunately, in the end, only a beneficial exercise in imaginative thinking. 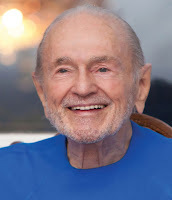 I participated very little in setting up the details of my program here in India, mostly because I was simply too preoccupied working on the Ananda movie and finishing the book of miracles and answered prayers. Also, never having done anything like this before, I felt unqualified to comment. First, I thought, let me gain some experience before I have an opinion. So many people called to register, that Devendra became concerned that we would have more than the room could hold -- the comfortable limit is something just over 100. So he decided to add another Level 1 class for Sunday afternoon. That made 5 programs in two days, which suited me just fine. I had been sitting alone reading Patanjali and was more than ready to get underway! Level 1 is a 5-hour class. We followed that with a 1.5-hour informal satsang, called “Walking in the Footsteps of the Master.” Sunday began with a 3-hour program on “Prosperity” -- which encompassed not only money, but prosperity of all kinds. Then we had a 4-hour Level 1. After an hour break, we had another 1.5-hour informal satsang, in this case questions and answers. Rather a marathon, but not that difficult. It was only two days. Our first Level 1, as anticipated, was overfilled and some had to be redirected to Sunday. We had about 110 people. Devendra did some of the teaching for both Level 1 classes. Still, for me, it was a nice toss into the deep end of the pool. Really wonderful. People are the same everywhere, and spiritually we are all made by God the same way. The teachings don’t change. Quite a few times, during the breaks, and before and after the programs, I found myself surrounded by a small group of truth-seekers. Their heart-centered receptivity was both a joy to experience and a great example to me of a deeply appealing way to be before God and one another. When I was speaking to the group, I was rarely at a loss for words (I am sure those of you who know me are not surprised to hear this! ), but I felt I went in and out of alignment with those to whom I was speaking. All credit for whatever flow there was goes to the magnetism, sincerity, and receptivity of the audience. All limitation was due to those pesky self-definitions that even 10,000 miles of travel was not enough to escape. There were many fine devotees and soon-to-be devotees in the people that I met there. By the fifth program -- Sunday night questions and answers -- I think I was feeling much more integrated. I am most interested to see how things go in the rest of my time here. As it happens, Bryan McSweeney was able to be there in Chennai. And, we hope, at all or most of the rest of the programs that I do in India. This means not only good video recordings (which will be posted on Ananda Palo Alto website, and perhaps Ananda India, also) but also, in some places, live streaming in real time of the programs. Timing doesn’t always work for everyone, since India is a 12-hour flip from America. And this time we put the notice out at the last minute, but once we confirm the ability to stream, we’ll try to let you know more in advance. It was delightful to get e-mails from some of you who watched from America my debut classes in India. I love Dwapara Yuga! Amit, who recently moved from Palo Alto to India, is also a travel companion. He is doing wonderfully well here. I had to laugh when I phrased it in my mind that “he looks at home here.” Naturally! He is from India, in fact, from Pune city, right where our community is located. His skill in the local language, as well as Hindi, is a great asset. Because of his supportive and competent presence, I am able to let go completely of any need to keep track of the practical details. A great blessing. And if Bryan can’t always be with us, Amit can take over the video and even the streaming where possible. Dhuti (formerly a resident of Ananda Village, now part of the global gypsy corps mostly following Swamiji around the world) was also with us in Chennai, and will be in Calcutta, where we go next. Her chanting, singing, and upbeat enthusiasm for everything is also adding a delightful element to the whole experience. One element of teaching here in India, which is a large part of what I am trying to intuit my way through, is the fact that, in contrast to the West, there is already enormous familiarity with “these teachings,” or so it seems. In the West, you have to struggle against the complete ignorance of many people (when they start on this path) about the most basic ideas: guru, karma, reincarnation, chakras, etc. Of course, nowadays, these words are more known, but still, people, although interested, are frequently skeptical. And, in the West we often go first by our intellects, which is not entirely a bad idea, but is different from the way Indians, as a culture, respond. Here, the basic tenets of this teaching are well understood. You don’t have to explain starting with the first letter of the alphabet. I was under the impression at that time that what Master brought to the West was “Hinduism,” or at least a variation on it. In those years, we lived a rather isolated rural life. The internet and cell phones didn’t exist. Forget radio or television. We didn’t have them and didn’t want them. And, oh yes, in most places there was no electricity so it wasn’t an option in any case. Ananda, especially at the Meditation Retreat where I lived at first, was its own world. Expansive, but self-contained. Swamiji was closer to his years in India and allowed that bhav to permeate the community. He often wore Indian clothes, had his hair long, and frequently sang the devotional songs he had learned during his time in India. And what did I know about Indian culture or religion? Only what I was learning there at Ananda. So I was a little surprised, many years later -- fast forward to 1986, our first pilgrimage to India -- to find out that Master’s teachings are about as Hindu as they are Catholic! Which is to say, you can see how the threads intersect, but what Master brought is exactly what he said he brought: A new expression. What we have now of Christianity and Hinduism -- both, in essence, Sanataan Dharma -- have come through the long transforming filter of Kali Yuga both descending and ascending again. You can see the eternal truth there, but it is not always obvious. Thus the need for Master’s incarnation. Babaji and Jesus together have planned the salvation of this age, as we are told in Autobiography of a Yogi and in Swamiji’s book The New Path. And this line of Masters is the expression of that new plan for a new age: Dwapara Yuga ascending. I’ve been thinking about these things for many years, from the comfort of the living room of Chela Bhava, where we live in the Palo Alto community. Now all my reflections are being refined in the cold light of day -- more accurately, the warm light of day -- in the company of these wonderful devotees. Swamiji’s simple advice to me about this tour is always in the forefront of my mind. Speaking first of his own life, Swamiji said, “Everything I have done has been in service to Master.” Then he added, “Think of what you are doing in the same way.” How simple. How divinely helpful. What is Master’s mission to India? How can I be an instrument of Guru’s intention to bring to the land of his birth, and the birthplace and eternal custodian of these teachings, Master’s new expression? At the moment I lack clear intuition, but I am sincere in my desire to serve, and trust that God and Guru will guide me. After Chennai, our traveling band took a plane back to Pune city. The plane was delayed 3-hours -- delayed air flights are a national sport in India, apparently -- and so we hung out in a café, sampling sequentially much of the menu -- until it was time to leave. The joy of Ananda is that just being with gurubhais is so delightful, it really doesn’t matter where we are or what we are doing. God and His joy are also present. Pune city is 1.5 hours from “the land,” i.e., the Ananda community. Pick-up had been arranged and we piled into a comfortable taxi for the ride, which included an important stop at “the best ice cream store in India.” I can’t speak about it’s national ranking, but taken on its own terms, it was definitely world class. Fresh fig ice-cream: highly recommended. The Pune community, in a rather remote rural area, some distance from the city, perched on a hillside overlooking a beautiful valley, is a little more advanced in its development than Ananda Village was when I arrived there in 1971. Jaya, who has lived in India for some years, and also is a founding member of Ananda Village, says Ananda Pune community is about where Ananda Village was in 1976 -- when so much of it burned down! I am quite comfortably -- let me correct that -- I am luxuriously situated in one of the large guest rooms. Spacious living area, large sleeping loft, my own bathroom, including a hot water shower. Everything -- and more -- that a devotee could want. I love being here. Many people here are living in tents, sharing the one shower house, so I am quite at the top of the food chain in terms of accommodations. So much is still simple, rural, and like a vibrant seed just sending up its first green shoots, bursting with potential, determined to reach for the sun, the air, and the sky. The residents number about two dozen, from a several different countries, including a core group of monks. Swamiji is in residence here now. It was the first priority when the community started: to provide a home base for Swamiji in India where he could rest and write and do whatever work he felt inspired to do, and still be able to travel and reach out to the rest of the country. It has worked very well. Never one to stay idle even for a day, Swamiji took up a most unexpected project, and in a little over a week, completed it. In the early 1900s a woman writer named Marie Corelli produced quite a few novels, some of which were popular at the time. She was a woman of sensitivity and spiritual idealism and wrote on those themes. Her novel, The Life Everlasting, is apparently the only novel Master ever read through to the end. Swamiji has read her books, and many of us at Ananda have also enjoyed them. There are so few novels with a genuinely spiritual theme. Her books stand out for that reason alone. Unfortunately, that could also be said about some of Marie Corelli’s writings. She seemed to like the sound of her own voice -- which was often lovely -- and sometimes forgot that to write more is not always to write better. Also, although deeply sincere in her spiritual aspirations, her understanding was limited. In The Life Everlasting, for example, the theme is perfect Love. A deeply appealing subject. The theme essentially is the idea of soulmates, which, in her book, ends up being the heroine (who strongly resembles the author herself) eventually uniting with her eternal romantic partner, and the two of them spending the rest of their lives -- actually, time everlasting -- cruising around on his fabulous yacht. I don’t mean to might light of what is actually a beautiful story. But her understanding was limited. Well, finally to get to the point, Swamiji has rewritten her book. He describes what he has done as “inspired by, and a complete rewrite” of Marie Corelli’s novel. He keeps her essential theme, plot, characters, and some of her beautifully descriptive prose, but expands, clarifies, and uplifts the whole theme. Without giving away the new plot, suffice to say, the story does not end with the two of them cruising around on a yacht for time everlasting. Their lives become more expansive and serviceful. He asked me to read the whole manuscript, in two sittings as he finished it, and I find it entrancing. I feel he captured her intention, took what she was able to do to the place where, I believe, she wanted to take it herself, but did not have the skill or wisdom to do. There is an exquisite vibration to what he has written, which deeply touches the heart, as the theme of perfect Love would do. He certainly sets the bar high for what it means to be a disciple serving the Guru. Yesterday I was invited to give a satsang for the community on the subject of discipleship. It was a lovely opportunity to share on my favorite subject: Swamiji as the perfect disciple. This latest creative work on his part just the last in a long string of such moments. 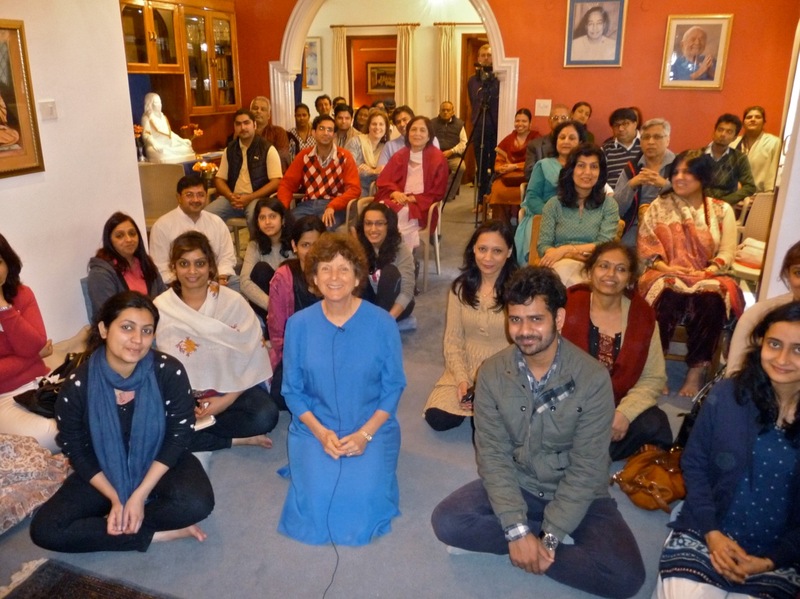 It was a joy to share with the devotees here, a deeply devoted group of disciples. 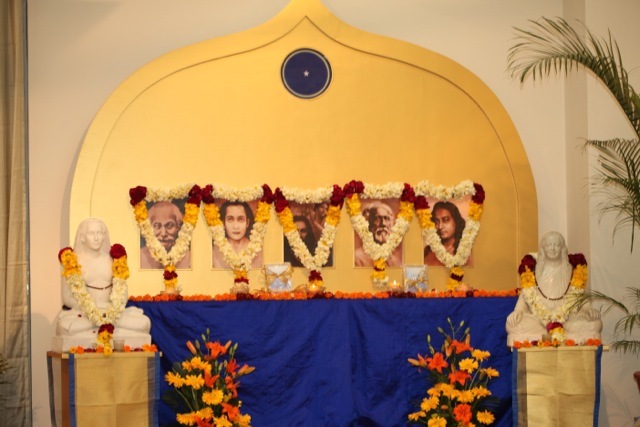 That satsang was filmed and before too long you can find it on the Ananda Palo Alto site. Which brings us pretty much right up to the present moment. The writing of this letter was briefly interrupted so I could attend a short blessing ceremony for the newest addition to the community: a compact white van, actually an ambulance, that one of the monks here, Aditya, who is also a medical doctor, is outfitting as a mobile clinic so he can more easily serve the rural residents. Also he is giving classes in various cities on true health and vitality and this new vehicle will serve that outreach ministry. He turned on both the flashing blue light (the traditional color here, nicely more appropriate for a devotee doctor than flashing red) and also the siren -- surprisingly mellow and sweet in tone. We gathered around the new vehicle, blessing both it and the whole enterprise. Then we ate coconut dipped in sugar, apparently the tradition when launching a new enterprise. Jyotish and Devi are also in India now. They spent time in Gurgaon, now they are in Bangalore for the weekend, and arrive in Pune next week. There was a meeting with them and all the leaders of Ananda’s work in India and one can feel the growing magnetism of all that is happening here. This weekend Jaya and I are sharing a few classes on the Patanjali commentary, which should be fun. The community is also a retreat and many weekends guests come. On Sunday Swamiji gives the morning satsang. I haven’t even mentioned Tushti and Surendra. I saw them just a little in Goa and Chennai, but since then we have been in separate cities. They, for the meeting in Gurgaon, followed by time in Delhi working on their visas (send a lot of light for the smooth and easy completion of that task). They return soon and then we will have more time together. At the end of next week, we all go to Calcutta. On the weekend, Swamiji gives the program. I believe I will also be introduced in the same way I was in Chennai. There we are having classes all through the week after, as well as the following weekend. 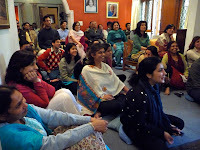 One late afternoon satsang each day, then a few more daytime programs on Saturday and Sunday. Because Swamiji’s programs are spaced some weeks apart, and since my programs are introduced by his, I find myself with these gaps of time with not that much public work to do. I wouldn’t have minded being busy everyday, but this cannot be called a hardship! So much delightful time with new and old friends, and a few opportunities to contribute, for which I am grateful. Once I go to Calcutta, there are three solid weeks of almost daily programs. First in Calcutta, then moving to Gurgaon, Delhi, and Noida, where we have established centers. They have arranged satsangs, classes, and also have set up one or two more public programs. Distance indeed makes this heart grow fonder and I thank God everyday for your friendship, love, and continuing prayers, that all of us together may grow more expansive in our service, more pure in our love, and more unconditional in our joy in God.